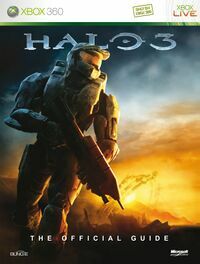 The Halo 3 Strategy Guide is the official strategy guide for the video game Halo 3 published by Prima Games. It was set for release on September 14, 2007, but later pushed back to September 25, the date the game was released. It contains a detailed map of each mission and multiplayer map which includes locations of the default weapons. The guide also includes a list of all the Achievements and how to unlock each one, a complete bestiary with notes on typical enemy armament, and an equipment list. The extras section has a list of nine of the 13 skulls (only the gold ones) with notes on what they do as well as recommendations on what skulls to use on what levels. It also covers how the meta-game scoring works with a breakdown of what enemy falls in what category. The primary layout features a quick walk through recommended for easy and normal difficulty levels on the left side of a page, even numbered pages, and an in depth guide for legendary. Advanced Multiplayer strategies reveal the best sniping spots, weapon & vehicle respawn times, team game tactics, Game Type rules etc. A dedicated campaign chapter offers practical advice for key battles on the lower difficulty settings, as well as a comprehensive Legendary walkthrough packed with in-depth expert guidance. Includes the different ways to earn Meta-points during Campaign. Throughout the guide, the icons for the Type-52 plasma cannon are erroneously those of the Type-42 plasma cannon from Halo 2. On pages 117 and 118, the guide mentions the non existant rank "Brute Trackers". This is not to be confused with the rank "Brute Stalkers", which also appears separately. On pages 117 and 118, the guide also mentions the rank "Grunt Ultras", instead of Grunt SpecOps. On page 130, a Jiralhanae War Chieftain is shown wielding a gravity hammer, instead of a regular Jiralhanae Chieftain. On page 131, a regular Jiralhanae Chieftain is shown wielding a plasma cannon, instead of a Jiralhanae War Chieftain. On page 131, the guide mentions the presence of "grey Grunt Ultras" and shows an image of a Grunt in dark grey armor, absent from the game. This is not to be confused with the lighter grey Grunt SpecOps which is also shown on the same page, along with the other ranks—though the latter are not explicitly named. On page 163, the sniper rifle's icon is that of a plasma rifle. On page 170 and 171, the icons for the bubble shield (2F) and overshield (1F) are switched. On the Sandtrap Multiplayer map page, the Sniper Rifle is absent, replaced by a Battle Rifle. The Guide says that Shades are unusable, when they actually can be used.